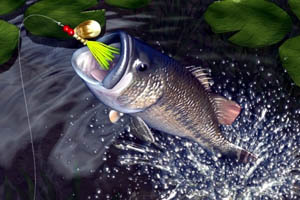 Look for the crappie and white bass fishing action to pick up in the next week or so. Late March and early April normally marks the start of spawning season for these two species. As these fish position themselves in pre-spawn staging areas, they will gorge on available forage, offering Oklahoma anglers a window of opportunity to fill up their stringers. “Three things really trigger the spawn: longer days, warmer temperatures and rain,” said Barry Bolton, Chief of Fisheries for the Oklahoma Department of Wildlife Conservation. White bass, also called sand bass, will hold in the mouths of creeks and rivers at this time of year, waiting for the rain to increase water flows. As water levels rise, look for the sand bass run to start. “With the rain this week, sand bass action should be picking up this weekend in the southeastern part of the state,” Bolton said. 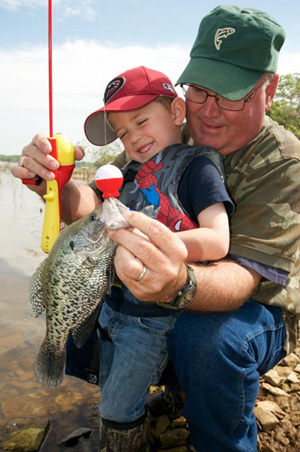 Crappie will hold on flats, in depths ranging from 6 to 20 feet, looking for baitfish. Once water temperatures rise into the mid- to high-50s, these fish will look for shallow cover, in depths ranging from 18 inches to 3 feet, to spawn. Days following rain in the next two weeks will offer the best opportunities to find active fish. Before heading out on the water, make sure to purchase a 2015 Oklahoma fishing license and remember to follow all Oklahoma fishing regulations. In a gill netting survey, fisheries biologists found these three lakes to be excellent for white bass fishing. Broken Bow: Launch a boat at McCurtain County Wilderness Area and navigate upstream to the first shallow rocky shoal. Anglers can also fish the shoreline of the upper Mountain Fork River from Broken Bow Wildlife Management Area. Lawtonka: Compared to other southwestern lakes, Lawtonka has relatively clear water making it an excellent fishing destination. Launch a boat from the marina on the north end of the lake, and fish the headwaters of Medicine Creek. Anglers should also try fishing along windy, rocky banks. Grand Lake: Above Twin Bridges State Park, anglers have the option to fish the Neosho or Spring River. Anglers can also try fishing the upper end of the Elk River, a 35.2-mile-long tributary of the Neosho River that flows into Missouri. This entry was posted in Sports on March 20, 2015 by admin.